CinemaBomb: Рыжик / Poil de Carotte / The Red Head. 1932, 1925. Рыжик / Poil de Carotte / The Red Head. 1932, 1925. Это полная версия фильма без купюр. The story itself is simple: a young boy is the odd one out. His parents are much older; his mother unmercifully picks on him, favoring his near-adult siblings, while his long-suffering father has withdrawn into the small pleasures of hunting and meeting with friends. Really, it's a sort of Cinderella: the wicked step-mother (only it's his real mother), the vain pampered older siblings, his having to work and slave for them, wearing tattered hand-me-downs. But it's told with a wonderful leisurely anecdotal naturalism, laced with delightful moments of surrealism (he's surrounded by double-exposure goblins when told to close up the hen house at night, for example). The greatest scene in the film combines the two, as the boy and a young girl "rehearse" a marriage ceremony, marching through the fields while the animals about them burst into song. The father, as delineated by Baur, and the maid, also immeasurably enriched by a subtle performance, are marvelous characters. The film was made during that brief period when the French countryside was a pre-technological world, yet technology was sufficiently advanced so that sound films could document that existence. Certainly there are "literary" story telling elements, such as the family being "introduced" by the father, the older maid telling the new maid what to expect, and the boy's school essay about his miserable family life. But the wonderful thing about the film is its ineffable technique and its enigmatic moments that are the purest styleless cinema. There are many visual joys, like the shot of boys playing leap-frog with the town spread out below them, that are presented with simplicity and unostentatious naturalism. All told, this is a film of the highest cinematic art, approaching the level of Renoir and Ozu. 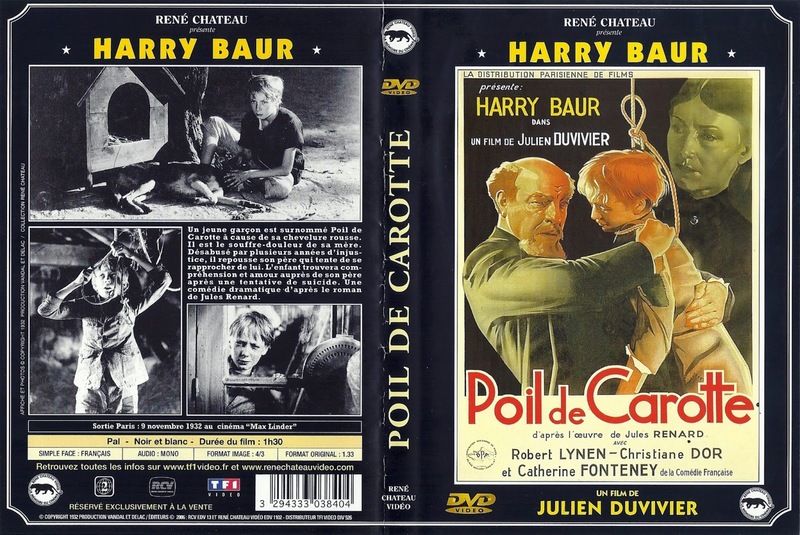 Adapted from various stories by Jules Renard, Poil de Carotte (The Red Head) is the poetically related tale of a delicate domestic situation. Robert Lynen plays the young son of Catherine Fourtenay. Fourtenay's husband Harry Baur knows that Lynen is not his son, but remains married for appearances' sake. Baur remains aloof and distant until he discovers the cruelties heaped upon Lynen by his resentful mother. Foster father and son develop a respect and friendship for one another that finally deepens into love. A remake of a 1925 film of the same name (also directed by Julien Duvivier), Poil de Carotte which made a star out of its juvenile lead Robert Lynen, whose genuine red head needed no touching up by the makeup men; sadly, Lynen was killed while fighting with the Resistance during World War II. Director: Julien Duvivier / Жюльен Дювивье. Cast: Harry Baur, Robert Lynen, Louis Gauthier, Simone Aubry, Maxime Fromiot, Colette Segall, Catherine Fonteney, Christiane Dor, Marthe Marty. Download Рыжик / Poil de Carotte / The Red Head 1932. Download Рыжик / Poil de Carotte / The Red Head 1925. Limbo / Children of the Night. 2013. HD. Блюз малышки / Baby Blues. 2008. HD. Последний день лета / Last Day of Summer. 1984. Бомба / Джинджер и Роза / Ginger & Rosa. 2012. Ева - Изгои / Eva - den utstötta. 1969. Cборник короткометражек, часть 37 / Shorts-37. Дерево колибри / The Hummingbird Tree. 1993. No Child of Mine. 1997. Аппассионата / Appassionata. 1974. HD. Прачник / Práče / Slingboy. 1960. Al Hevel Dak / The Thin Line. 1980. Mon dernier été / My last summer. 2016. Мальчик гейша / The Geisha Boy. 1958. Девочка-модель / Girl Model. 2011. Барби / 바비 / Ba-bi / Barbie. 2011. Голые / Golasy / The Naked. 2002. Бродячие псы / Jiao You / Stray Dogs. 2013.